Valleys to Coast Housing (V2C) is a not for profit organisation who provide affordable homes to rent and buy across the County Borough of Bridgend in South Wales. Their mission is to provide homes in thriving communities where people feel safe and want to live. V2C provides management, maintenance and improvement services to 5,835 rented homes, 722 leasehold flats, 1129 garages and 50 shops. The home improvement service that V2C provides, allows their customers to report repairs required within their homes. Sometimes appointments to carry out repair work are not kept by the customer due to their busy lifestyle, change in routine and forgetfulness. The failure to carry out the repair costs V2C in both time and money and therefore becomes ineffective. The failed appointment also costs the customer their time to book another appointment and a further delay in the repair work. The solution was to send customers a series of appointment confirmations via SMS, in turn, improving their customer experience. The process included an initial SMS to the customer confirming the appointment, the time and a telephone number to rearrange. A second SMS would then be sent the day before as a reminder and a final SMS would be sent as the engineer is on their way to the customer’s home, detailing the expected arrival time. The number of missed appointments dropped by 27% in the first six weeks making savings in both staff time and efficiencies in the maintenance team. There has been an increase in communications between V2C and their customers, allowing them to build better relationships. They are now seen as a digitally savvy organisation, adapting their services to the developments of new technology. 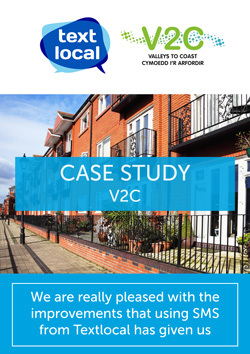 Staff at V2C are considering using Textlocal for other parts of the business to improve communications and engage with their customers better, such as events and rent accounts. Streamlining housing maintenance requests with SMS.